Andre Lotterer set the fastest lap of the weekend so far during a shortened second practice session for the World Endurance Championship six-hour race at Spa Francorchamps as Audi once again dominated the top spots. The session was stopped early after Alexander Sims crashed the Status Lola Coupe at the top of Eau Rouge. The former McLaren AUTOSPORT BRDC Award winner shunted heavily but emerged from the significantly damaged machine unscathed. Lotterer set his best time in an e-tron R18 on new tyres in the final third of the session and ended the day more than three tenths up on his team-mate Allan McNish, who also bolted on a new set of Michelins late on. 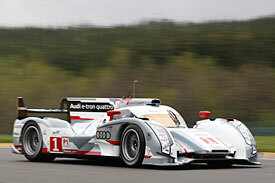 The two conventional R18s of Oliver Jarvis (fastest of all for a while) and Loic Duval were next up. Nick Heidfeld, who shares the Rebellion Lola with Neel Jani and Nicolas Prost, was the quickest petrol runner ahead of the Pescarolo Dome. Andrea Belicchi was seventh in the sister Rebellion car. Olivier Pla was fastest LMP2 runner in the Oak Racing Morgan-Judd ahead of Thomas Holzer in the Lotus Lola coupe.